I learned a few things watching Ohio State live against Indiana. It’d be worth rewatching the game to study their passing game more but I feel pretty confident with this initial assessment. Here are a few scattered thoughts I had about the Buckeyes in terms of how they match up to the Sooners. The Buckeyes look weakest at trying to push the ball outside the hash marks in the passing game, which is already probably a place of strength for the Sooners with Jordan Thomas returning and Parnell Motley emerging opposite him. Their guards are both tall, too tall maybe, as each are listed at 6-7. They had a lot of trouble getting under the Hoosier tackles and clearing them out in the run game, but then J.K. Dobbins was so slippery that he didn’t need all that much room to get loose. They can still run QB stuff to J.T. Barrett to pick up tough yards in key situations and it’s still mighty difficult to stop them. Scheming up their split zone play from 2×2 with an H-back accompanying Barrett in the backfield is a priority if you want to beat them. There just aren’t any great ways to handle this play. Barrett knows how to read the play so as to attack behind the double team or the trap block by the H based on how the linebackers try to fill the play. It’s hard enough to stop split zone when it’s the RB getting the ball but when it’s the QB it’s nearly impossible unless you’re winning key blocks up front. I guess OU’s best bet is to start with somewhat wide LBs and then crash them in hard while leaving the defense of the bubble screens to the CBs and Ss. Barrett can’t read for run or pass as decisively AFTER the snap so you want to muddy the waters and get him to do what you want. Another idea would be to just load the box and dare them to beat you with the bubble screens. Spinning to single-high can’t save you because an OLB will still be put in conflict by the bubble. It’d have to come after the snap when you’re confident Barrett wouldn’t throw it. 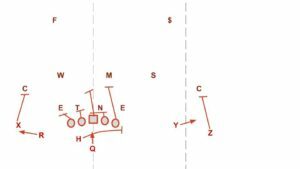 The Buckeyes’ passing game is improved by their work to master mesh concepts like the one I illustrated in the article. Here’s the problem for the Sooners. Beating Ohio State this season is going to be about loading up between the hash marks AND mastering all of their option and pass game concepts they can execute in that area of the field. One of Narduzzi’s Spartan defenses would probably eat them alive because they’d be ready to execute their run fits and match up on all of the rub routes. OU’s defense that is loading the middle of the field with inexperienced players in a new scheme? Not as well equipped for this task. We all saw in the spring game where they were at as recently as a few months ago at successfully matching the route distributions on mesh concepts. Ohio State’s defense is going to be pretty good again (no duh) mostly because they are going to be very good in the box and they’re still pretty good outside as well. Indiana beat them up pretty good throwing to big Simmie Cobbs Jr matched up on their shorter cornerbacks, I have my doubts that Ceedee Lamb will be ready to do likewise although I guess we can’t rule it out. It’s probably safe to assume that Ohio State will be back in their cover-1 rat coverages against OU with the extra LB (rat) helping to eliminate routes in the middle of the field to Mark Andrews. OU needs to attack them on the perimeter with speed in order to clear space to run the ball inside. The battle between the OU OL and the Ohio State DL is going to be strength on strength. Indiana couldn’t run the ball or consistently protect Richard Lagow, even after running 80 plays with tempo, because the Buckeyes had so much quality and depth at front that kept coming in waves. That’s not something the Sooners are going to have to deal with to this extent in the Big 12 and it’ll be interesting to see how well they handle it. Overall I still don’t at all like this matchup for the Sooners. Add in the fact that this game is taking place in Columbus at primetime and you’ll have a fired up Buckeye team that already knows they can handle some adversity after their tough opener against a conference opponent.